Oooh, my first drugstore foundation! I say real, because though I own the Bourjois CC Cream, it's a CC Cream with minimal coverage. 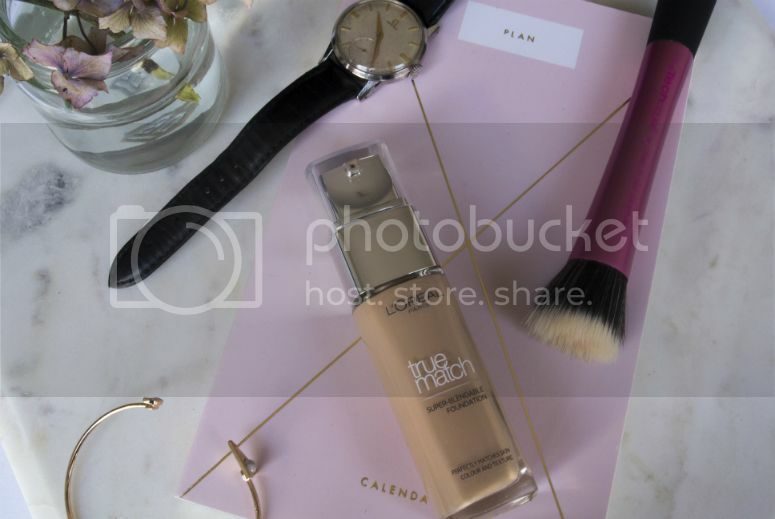 The L'Oreal True Match Foundation really is my first actual foundation from the lower price-point. I feel a little embarassed to say it, but at the same time, I am so bad at finding the exact match for my skin, and have trouble with the lighting in Boots and Superdrugs that each time, I tend to think "oh I'm this shade, no I'm this shade" and end up walking away because I am too scared of getting the wrong shade and looking like I'm a visitor from the sitcom Benidorm or turned into a ghost. However, for my Budget Month series, I steeled myself and successfully managed to find a few that matched my skin, and here is a review of the first. The L'Oreal True Match Foundation range is quite vast. I am amazed that they had such a huge range of shades. You will need to go to a larger store to see the full range, there are just so many. I think you would be hard pressed not to find one that is reasonably close to your skin, so bravo L'Oreal for that. They cleverly have sectioned the shades into Fair, Medium and Dark, and tones of warm, medium and neutral, to make it easier. You might feel overwhelmed by it all, but at the same time, you've got pretty much all shades and tones considered here. My face is still slightly tanned from summer, so I picked up the shade 5.N Sable Sand. The reason I was happy with the shade range is that I find drugstore foundations always lean fairly pink which doesn't suit my skin; this range covers that problem off. The foundation itself is easy to use, coming with a built in pump dispenser. Seriously, high end foundations need to start thinking about how unfair it is to make us buy separate pumps considering their foundations are pricier, when L'Oreal and other budget foundations can sell theirs with one built in. Ok, little whinge over, back to the review. Two pumps gives full coverage, so I tend to dispense one and a half pumps to get a medium coverage, and then apply concealer to any scars. It's an easily buildable foundation though, so you can go full-on if you like. The foundation is very comfortable to wear, and starts off looking quite natural. I've heard it's been compared to the Giorgio Armani Luminous Silk, but on my skin as it is, it actually reminds me more of the NARS Sheer Glow. Including the lasting power. Though I like the NARS Sheer Glow, it slides and ends up being greasy after about 5-6 hours. The L'Oreal True Match behaves very similarly on me, but I think I look greasy within 4 hours. Not good by my standards. I find setting powder is a must with this foundation, and to really combat shine, I put on powder before and after I apply foundation. Yes I look very matte for a while, but then by the end of a working day I don't look like a greaseball. I did have the problem also that it ends up looking a tiny bit too dark by the end of the day, so if it did manage to start impressing me during the change in season, I would have to pick up a lighter colour. I don't dislike this foundation as such, but I won't lie and say that I'm in love either. Though the shade range has impressed me, I think it's going to take a change in my skin situation for me to really embrace it. If I were into giving ratings, I think this would score a 6 out of 10. Not bad for my first drugstore foundation, but not great either. Do you have any drugstore foundation recommendations for someone who is a bit phobic of them?